A love of steam and railways may be considered purely a man-thing, but try telling that to Emma Safe and Christine Pulham, two artists who are proving that ladies are as capable of successfully depicting the genre as men. Steam duet: North Eastern Railway 0-6-0 No. 876, with fellow NER locomotive 2-4-0 No. 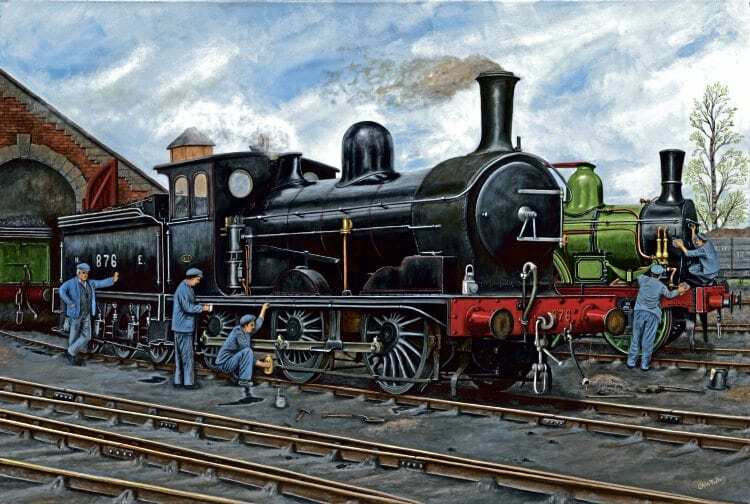 910 alongside, at Kirkby Stephen East in a painting by Chris Pulham that is raising funds for the restoration of the two locomotives. Both have in recent years become associate members of the prestigious Guild of Railway Artists, and each is ploughing a furrow in their different ways as they translate their interest onto paper and canvas. Emma is a 42-year-old Liverpool Art School graduate who works as a full-time artist from her home in the West Midlands. She is particularly interested in station scenes, and sets up her easel on a platform or concourse and draws the scene in front of her in a distinctive style using charcoal on paper.